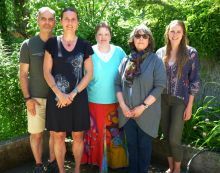 Tweedsmuir Travel was founded in 1987 by Terry Corbould (long time resident of the Bella Coola valley and B&B owner). We purchased the business in June 2008, and we take pride in providing a first class service for both resident and visiting travellers. Tweedsmuir Travel is based in the Bella Coola Valley, situated on British Columbia's Central Coast. Our remote and beautiful location is surrounded by high mountains, glaciers, and rain forest - a place where outdoor wilderness opportunities are endless. Tweedsmuir Travel is pleased to serve several First Nation Bands from the Central Coast, the Chilcotin region as well as other regions of British Columbia. We are entrusted with making the necessary arrangements for their medical and business travel. We have an excellent working relationship with Pacific Coastal Airlines - serving the valley with daily flights to Vancouver – ranking as the airline’s top selling travel agency in British Columbia. Tweedsmuir Travel is also a BC Ferries representative and sales agent (serving this valley with ferry services to the outer coast and Vancouver Island). Markus and Kirsten Schieck emigrated from Germany to Canada in 1996. After spending 5 years in the beautiful and peaceful province of Nova Scotia, and after adding a real “Bluenoser” to the family (their first son Aaron), an opportunity arose to move closer to the mountains of the West Coast. The family moved to Squamish, British Columbia in 2001 where they welcomed the birth of their second son Jaymen. It was after spending a family vacation in Bella Coola, that the beauty of the Valley felt irresistible. The Schiecks followed their dream and have made their home here since 2007. Markus backpacked for weeks at the time, with his fly-rod and his girlfriend (now wife) travelling extensively through Northern Europe and North America. He finally left Germany in 1996 to seek a new work challenge in Canada. Markus' new career demanded that he travelled often from Coast to Coast. His boyhood dreams always brought him back to BC and the West Coast. Now after almost 20 years of corporate life, he has achieved those dreams - living in the Bella Coola Valley and being his own boss. Besides exploring and developing potential business opportunities for the travel agency, Markus also enjoys his favourite outdoor activities with his family. Life can’t be better than this!! Kirsten discovered her interest in travelling and the travel industry at a young age. She completed her apprenticeship as travel agent and worked for 10 years in the travel industry in Germany, before moving to Canada. 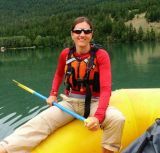 Kirsten enjoyed working in the tourism field in Squamish and Whistler (as tour organizer and tour representative, white water raft guide, and bald eagle float trip guide) before moving to Bella Coola. When not being a "Wonder Mom", Kirsten continues her work as a travel agent, where she enjoys being her own boss too! It was during a flight from Williams Lake that Karen considered Bella Coola to be more than a beautiful place to visit. The autumn colours across the Chilcotin Plateau set the stage and the descent into the Bella Coola Valley was breathtaking. Landing at the airport was like stepping back in time – life seemed to slow down. The air was clean, the water untreated and there was no rush hour traffic. What more could a girl ask for? It was an easy decision to trade city amenities for rural life in a friendly, hospitable community….in 1978 Bella Coola became home. The following years were busy raising a family and working full time. 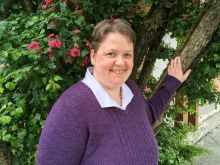 In 2002 while arranging the family winter vacation with Tweedsmuir Travel, Karen was offered a part time sales agent position – of course she accepted! Also born in Germany, Sina found her home in the Bella Coola Valley in October 2015. Beside an amazing community Sina is enjoying the clean unpolluted air while hiking through breathtaking nature. Singing in the Community Choir as well as the Church Choir Sina is also interested in kayaking and horses. Coming from a hotel management position helps Sina with her current job as well as her bookeeping experience.